Chick-Fil-A Frosted Lemonade is quite frankly irresistible. If you have never tried one, and you are near a Chick-Fil-A, I would highly recommend that you go there and try one. Chick-Fil-A is one of America’s favorite drive-thru restaurants. The chicken sandwiches are amazing, the waffle fries are very unique, and the Chick-Fil-A Sauce is one of the best sauces ever. Their food is always fresh, and hot. Which easily separates it from many restaurant drive-thrus. If you have never tried one of their Frosted Lemonades are you are certainly missing out. It combines the perfect amount of sweet and tartness that has ever hit your mouth. This creamy shake will knock out that hankering you have for something sweet. Many recipes online have you making this with homemade lemonade (which I adore), and ice cream. For me, this recipe is a little better when you use a frozen lemonade concentrate. Why the lemonade concentrate? 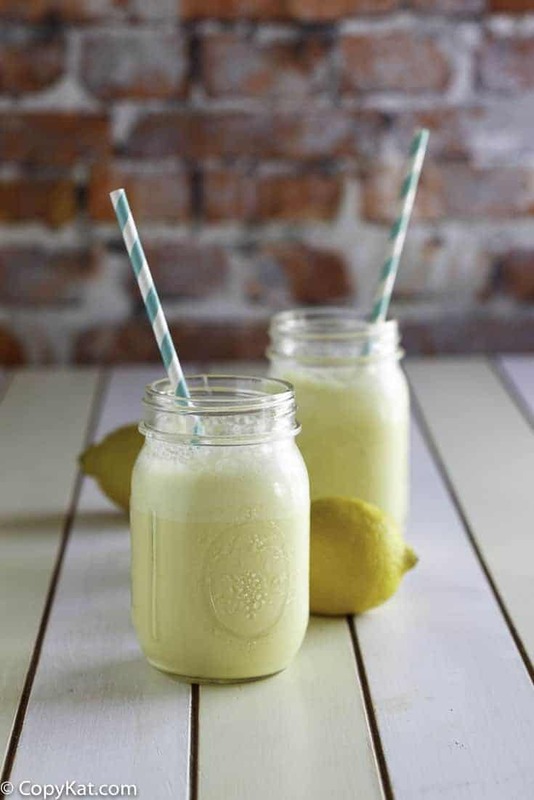 I think you can get a thicker shake without sacrificing any of the lemonade flavors that make this frosted lemonade stand out from the crowd. If you are like me, I love Chick-Fil-A, but sometimes I want them on a Sunday, so I have to make a copycat recipe if I want some Chick-Fil-A right now. Love fun drinks? Check out these other famous copycat drink recipes. Have you ever wanted a Chick-Fil-A Frosted Lemonade on a Sunday? Now you can make one yourself. Combine both ingredients in a mixer and blend until smooth and creamy. This is the first recipe that I have tried from the site. I used Bryer’s homemade vanilla ice cream and Minute Maid frozen lemonade concentrate. I doubled the batch since this recipe is for a single serving. Using just the ice cream and lemonade, it turned out more like a gelato and was not nearly the same color as the photo. Neither of those is a detraction from the recipe and my wife and I loved it. I think if you really want the frothy more liquid consistency you’d probably have to add milk or some type of liquid to loosen it up. Either way, it’s a good summertime drink. I am glad you enjoyed the recipe. I think their version is thicker. I am glad you enjoyed the frosted lemonade! Their diet frosted lemonade is killer, any idea how to make that? I would swap for a low calorie lemonade and a no sugar ice cream. This is a perfect copycat! Thank you for sharing the recipe!! It’s so easy to try! Do you have a refried bean recipe like Filibertos? I am sorry I don’t have a similar recipe. I’ll have to check it out. Looking for Krogers fluffy frosting. They have two kinds, but this one is lighter and less sweet. Thank you for your recipe request. I am sorry, I don’t have this recipe at this time.